It’s never too early to think Halloween. Get just the right costume now before you forget and run out of time. I know Halloween is still months away but never can be too ready right? HalloweenCostumes.com has a large variety of costumes for a fantastic price. In fact, last year this is where I got my son’s cute monkey costume and I am sure I will buy him one fromt here this year. Do you attend Halloween parties? I typically don’t but let me tell you I would love to relive the 80’s and be Rainbow Brite or Strawberry Shortcake. Oh how I love them when I was a child. Speaking of children they have a large varitey of children costumes from infant to tween. Surly they will be able to find something of their choice. This giveaway is sponsored by HalloweenCostumes.com, where you can find a large variety of TV and movie costumes. If you’re looking for a more retro 80s costume, HalloweenCostumes.com has you covered. Their costumes for Halloween are fun to wear to parties, too! HalloweenCoustumes.com is giving one lucky ready one free costume up to $60.00. This giveaway ends 06/01/11 11pm EST. US residents only. Mandatory Entry- You must go to HalloweenCostumes and let me know costume you like. Must be your first comment. I love the Kid’s Captain Black Pirate Costume for my son. He would love it! Owen’s Mom´s last blog post ..Mamavation Monday Food Fueled! 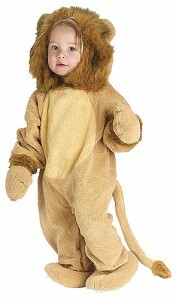 id LOVE to see my sonin the baby lion cub costume… soooo cute!! i put i wanted baby lion cub costume as first comment.. but i dont see it?? I liked the Baby Lion Cub Costume!! My son would look so cute in it! I like the Child Deluxe Darth Vader Costume. I would love love love to win the toddler ragdoll costume for my daughter!! Raggedy Ann is her FAVORITE doll!! I love the Child Spiderella Costume. Very Cute! My daughter would love the kids Belle costume! tweet from5/27 i posted here but dontsee it? Really!!! !Halloween is the most wonderful and awaited night of the year.It comes with lot of excitement.And definitely you need yourself and your kids to look unique in the party.Thanks!! !